Well Disinfection - NOVA HOME INSPECTIONS, INC.
During startup of seasonal wells. Wear rubber soled shoes or boots, preferably waterproof. Wear protective goggles or a face shield when working with the bleach. Well pits pose an extreme hazard as they frequently contain a build-up of toxic gases or simply lack sufficient oxygen to sustain life! DO NOT ENTER WELL PITS! Death can occur in even a shallow well pit. 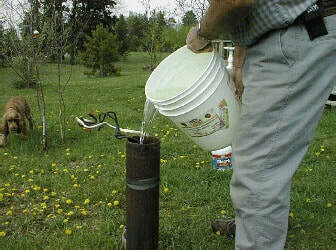 Refer disinfection of wells in pits to licensed well or pump contractors. Bypass devices such as softeners, bait tanks, & livestock to prevent damage to the device or animals. This would also be a good time to install a new filter element if the water system has one. Since softeners themselves may be a source of contamination, it is good to disinfect the softener at the same time the well is being disinfected. See the end of this document for a softener disinfection procedure. Turn off electrical power to the pump. 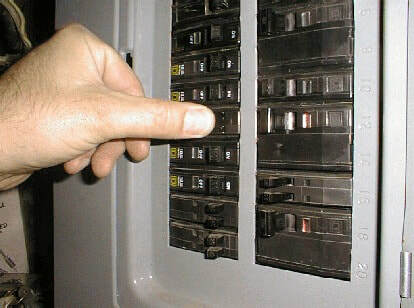 If the breaker box has a “lockout” hasp to prevent someone from accidentally turning on the water pump circuit breaker, use it. With electrical power off, remove the well cap and lift the wires/wire nuts aside. 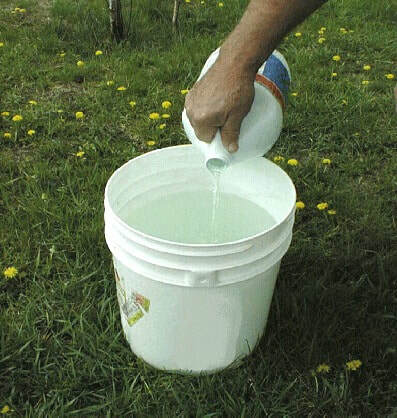 Add ½ of 1 gallon of bleach to a clean pail with about 3 gallons of water. This is generally sufficient to disinfect a 4 inch diameter well 100 feet deep or less. Pour the mixture into the well. Recirculation of chlorinated water helps to wash down the sidewalls of the well casing, mix the water column thoroughly, and distribute the chlorine. • Place garden hose into well casing. • Turn on pump power. 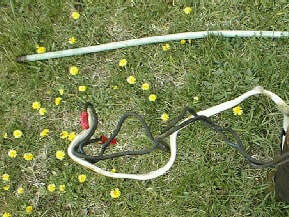 • Run garden hose from the water system and put it back into the casing to recirculate water. Recirculate for about 2 hours from the time you smell chlorine from the garden hose. You may notice that the water coming from the garden hose turns reddish for a brief period. This is due to the chlorine precipitating iron in the water. If the water appears excessively red and cloudy from this reaction, discharge the hose outside of the casing until the water runs clear. 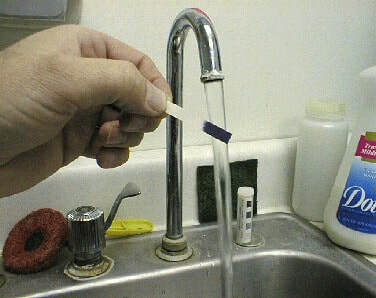 *Faucet aerators may need to be removed if clogging occurs from precipitated iron. Let system set overnight with chlorine in the water lines. In the morning, run a garden hose to flush out the system. Since chlorine will kill vegetation, direct the water to an area where it won’t matter if plants are harmed. Do not run the water into your septic system as the amount of water required to flush the system may hydraulically overload the septic system. TOTAL chlorine must be absent prior to taking water samples for coliform analysis. While this test isn’t necessary for the homeowner, be aware that any amount of chlorine left in the system may erroneously result in a negative coliform test. When a chlorine test kit is unavailable, wait a few days after the last trace of chlorine odor has dissipated before submitting a water sample for coliform analysis. This will ensure a valid test result. It may take as little as ½ hour or as much as 4 days to completely remove the chlorine odor from the water system. This is dependent upon many factors including: the height of the water column in the casing, well drawdown, and pump capacity. 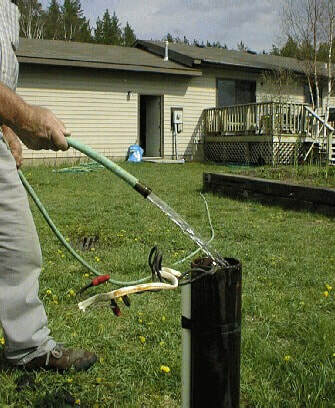 To facilitate faster removal of the chlorine in stubborn cases, a hose splitter may be attached and one hose run back into the casing and the other hose pumped to remove waste. Water heaters take a long time to flush out once chlorine has been introduced into them. Do not shower/bathe with water containing high levels of chlorine due to the possibility of damaging your eyes. If you elect to drain down the water heater to remove the chlorine, be sure to turn off the electricity or gas to the heater otherwise the heater will be damaged when the water recedes from the heating elements or burner. It is not unusual to require 2, 3, 4, or more disinfections to clear water systems of coliform bacteria that have been growing in the system for a period of time. If the well refuses to clear, a licensed well driller should be enlisted to utilize special techniques and equipment to flush the well. It is essential that any water system defects that could allow surface water to enter the well be corrected. Plumbing grit and precipitated minerals may form when the chlorine is added to the system. This grit can cause clogging with faucet aerators, flush valves, water solenoids, and equipment using filters. • During the disinfection process, turn softener to ‘Bypass’ once chlorine is first smelled in a softened water tap. 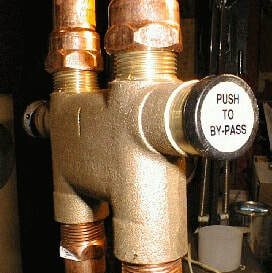 • Keep unit on bypass until chlorine is flushed out of the system. • To disinfect the softener, add ½ cup bleach to the brine tank and regenerate the unit. Frequently, coliform bacteria will regrow in the water system after about a month. For this reason, it is important to retest approximately 30 days after disinfection. If coliform is again detected, disinfect the well using the same procedure.